The Global Livingston Institute (GLI) in partnership with the Rwandan Cycling Federation (FERWACY), will host its first public health concert in Kigali this Saturday. The Tour du Rwanda Concert will leverage the use of music and the arts as a platform to showcase and celebrate Rwandan cycling and culture, as well as serve as an avenue to promote public health and economic development. 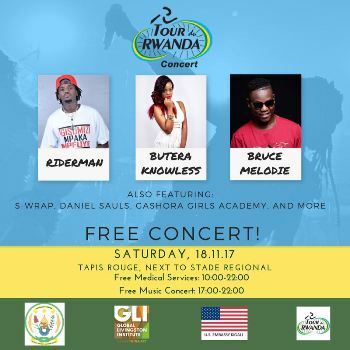 The the completion of Stage 6 of the Tour du Rwanda concert will feature performances of renowned local artists among them; Butera Knowless, Riderman, Bruce Melody and a special performance by students at Gashora Girls Academy. The US will be represented by musicians from Nashville and Tennessee. The concert will kick off at 5:00 p.m to 10:00 p.m, before that, revelers and cycling fans will receive free medical services from 10:00 a.m to 10:00 p.m.
“The U.S Embassy is pleased to support GLI and this great effort to raise awareness around such important health issues such as HIV/AIDS. We are at an unprecedented moment in the global HIV/AIDS response. For the first time in modern history, we have the opportunity to change the very course of a pandemic by controlling it without a vaccine or a cure“, said U.S. Embassy Spokesperson Neda Brown. “We are excited to work on this initiative with the GLI and FERWACY to use music, the arts, and cycling to foster healthier communities in Rwanda,” said Diane Gashumba, Rwanda’s Minister of Health. “Music and sports play an important role in reducing stress and preventing noncommunicable diseases. This collaborative effort will be a celebration of our culture and public health.” She added.